CORRECTION TO THIS ARTICLE: The Sept. 6 version of this article incorrectly stated that MIT was fined $75,000 by the federal government for spending too small a percentage of its funds from the Federal Work-Study Program on community service. MIT had $75,000 in unused Federal Work-Study Community Service funding that was made available to the government for use by other schools. MIT ranked number one this year, but not on the U.S. News and World Report’s ranking of national universities. Instead, MIT topped a new ranking, made by the political magazine The Washington Monthly, that focuses on universities’ service to the country. If The Washington Monthly had performed its assessment three years ago, however, MIT probably would not have won. An important factor in MIT’s top ranking is its turnaround over the last three years in how it spends funds from the Federal Work-Study Program. The FWSP gives money to universities to help pay financially needy students who choose to work while in college. Congress mandates that seven percent of this money go toward community service work. Until recently, MIT, which received $2,228,063 for 2004–2005, had always fallen far below seven percent. In fact, The Washington Monthly ran an article in its January/February 2002 edition showing that MIT was violating federal law by spending only 1.9 percent of funds on community service. Shortly afterward, in February 2002, the government fined MIT $75,000. 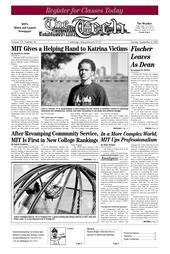 MIT has since improved the situation, and spent about 20 percent on community service in 2003–2004. “MIT leaped from near the bottom of the pack three years ago to near the top today,” wrote The Washington Monthly in its College Rankings article. Making the improvements was not easy, said Jane D. Smith, director of the Student Employment Office, which is responsible for the use of work-study funds. In one of its first efforts, the Student Employment Office joined with the Public Service Center to develop ReachOut, the MIT branch of AmericaReads, a tutoring program for young students developed under former President Bill Clinton. Because MIT has no education school, the project was not easy to implement, Smith said. MIT ultimately sought help from Harvard’s Language and Literacy program. She said MIT hired a literacy professional to train students in tutoring skills, and 40 to 50 students per year now participate in MIT’s branch of AmericaReads. As a consequence, one program developed to be conveniently on campus is a four to five week summer tutoring program that pays students eligible for work-study. The SEO also spent time developing a system allowing students to be paid with FWS funds for community service positions in their home towns over the summer. The PSC also oversees a summer housing program for MIT students who would like to stay on campus over the summer while working at least 20 hours per week in a community service project. MIT did not stop at seven percent, and this clearly helped it reap The Washinton Monthly’s recognition. The Washington Monthly created its list to make people think about college rankings in a new way. “While other guides ask what colleges can do for students, we ask what colleges are doing for the country,” states the magazine’s introduction. Specifically, The Washington Monthly chose to look at three criteria: social mobility, research, and community service. Social mobility is determined by how a university’s graduation rate compares to the expected rate given the number of Pell Grant recipients it has. Research comprises two figures: the total amount of money invested in research and the number of PhDs awarded in science and engineering. Community service was weighted equally among three factors: students in Reserve Officer Training Corps, students serving in the Peace Corps, and the percentage of federal work-study dollars invested in community service. The overall system used by The Washington Monthly is similar to that used by the U.S. News and World Report in that the rankings are produced using a combination of different statistics about the universities. The Washington Monthly, however, uses completely different criteria, none of which are directly scored by USNWR. Unlike many highly prestigious schools, MIT placed highly in both rankings. MIT ranked first in undergraduate engineering programs and seventh for national universities in the latest U.S. News and World Report ranking.